Since windows in the control room had to be omitted, the “Virtual Sky” was installed as an alternative. PCK Raffinerie GmbH processes about 12 million tons of crude oil annually into mineral oil and petrochemical products. Up until 2016, all production facilities were monitored and controlled via a central control room dating back to 1993. However, this room had become too small over time, which is why the management decided to replace it with a highly modern, roughly 1000 m2 control room and develop an in-house concept geared towards the company’s special requirements. The fine tuning and implementation of the new control room at PCK Raffinerie GmbH in Schwedt took place in cooperation with various partners. 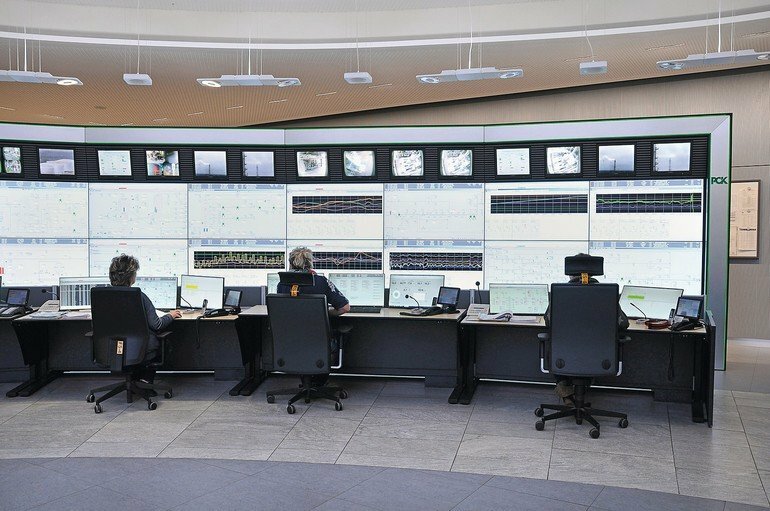 Jungmann Systemtechnik (JST), for instance, was entrusted with the interior design and technical equipment: in addition to six control consoles with a total of 25 operator stations and 78 monitors, the control room experts also installed video walls with 100 displays for proactive control of the plants. “PCK has been striving towards centralised control rooms since as long ago as the 1990s, when we consolidated eleven satellite control rooms in the old, central control room. We’re now taking the next step by replacing this control room with a more modern one. During the next three years it will gradually take on the tasks of four other satellites”, explains Thomas Taube, division engineer for maintenance services and project coordinator at PCK. The company still has a total of seven control rooms at present – including the new 1000 m2 main control room, which is at the heart of the refinery. The entire process chain is monitored and controlled here – from the arrival of crude oil via a pipeline from Russia through the various steps in the production facilities to the finished, ready-to-ship product. 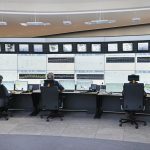 The control room consists of six control consoles which are acoustically separated from one another by non-reflective glass walls and equipped for regular operation with three operator stations each as well as one reserve station. The control room is big enough for 24 people at once. Since PCK works in four shifts, there are normally 125 plant operators including standby personnel. This will presumably be the case in May 2019, when all six control consoles are fully staffed. PCK developed the concept for this control room itself and subsequently implemented it together with partners. 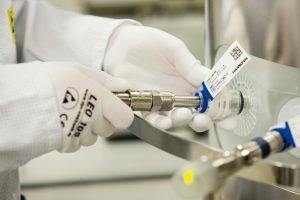 “For example, we had a very clear idea from the outset of how the production facilities should be controlled in the future”, says Taube. 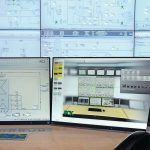 “The fundamental requirement was that the plant should be operated via the video wall in combination with smaller monitors.” Comprehensive research and market analysis was undertaken in the search for a suitable solution. Following an extensive trial with a test workplace, PCK opted for a holistic solution from Jungmann Systemtechnik. Amongst other things, this covered the layout concept, furnishings, video systems and multi-consoling hardware and software. The control room equipment from JST is now located in a new, windowless bunker building, which was constructed using 3200 m3 of concrete and 520 tons of steel. The building is protected against pressure and explosion. Since windows had to be dispensed with in the control room, the virtual sky was installed as an alternative. 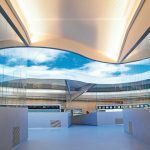 This is a 105 m2 illuminated ceiling which PCK developed together with the Fraunhofer Institute for Industrial Engineering (IAO) in Stuttgart. 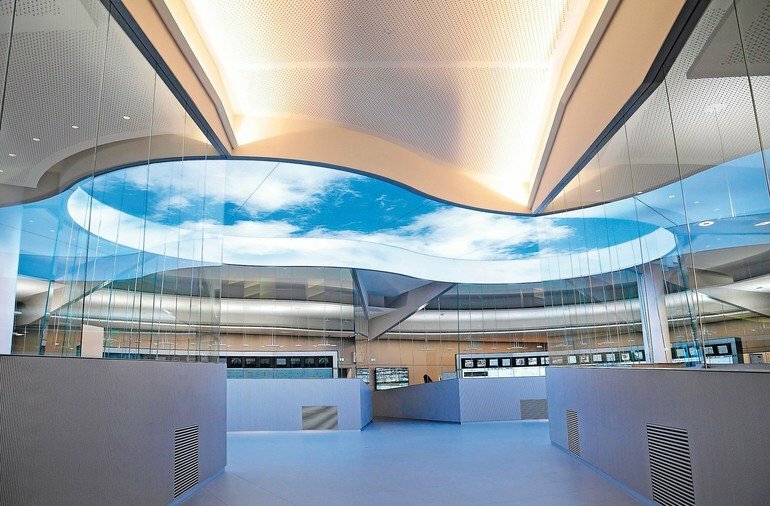 It simulates the sky at any time of the day or night and thus ensures a pleasant working atmosphere. “It was also crucial for us to increase the availability of the process technology and achieve a high level of flexibility while using the control system”, Taube continues. “At the same time, the objective was for every point in the plant to ideally be accessible from every workstation.” Apart from the process control technology, this is mainly the responsibility of the hardware and software developed by JST for controlling the workstations and video systems: “Multi-consoling correlates monitors, in other words each plant operator always sees precisely the information they need at any given time on one of their monitors”, explains Jungmann. “Up to 1000 different process images can be connected to one workstation in this way.” The number of monitors per workstation was reduced as a result. The visualisation surface on which a plant can be represented was simultaneously increased fivefold. Moreover, only one keyboard and mouse are required for the different views on each workstation. “In the past we had four keyboards per workstation and were forever jumping back and forth between them”, Taube adds. 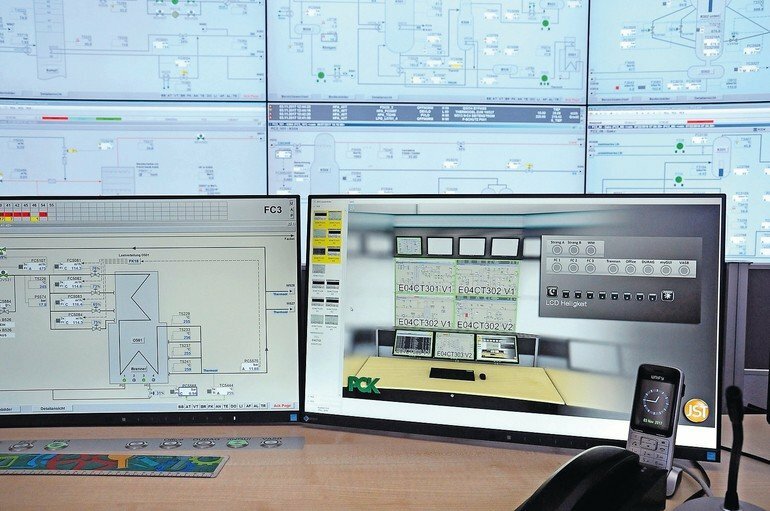 That was not only inefficient and inconvenient; the control room operator also found it difficult to see at a glance which monitor belonged to which device – a potential source of error which has now been eliminated. So-called mouse hopping, another multi-consoling function, helps too: “For example, operators can drag the cursor across all monitors at their workstation as well as up the monitor wall using the mouse”, Jungmann reports. All in all, this special console concept enables a comprehensive overview of all key processes in the plant. To ensure optimal control of the process graphics, PCK creates an overview display of each operating area and then projects these three views onto the video wall, so that together they provide an overall view. Taube: “In practice, the overview of each operating area is normally always displayed in the top row of the video wall. As a result, you can see instantly what is going on in the plant at a particular moment in time and determine where a fault has occurred or where intervention is necessary.” Operation of the plant is generally controlled using the monitors at the bottom of the video wall, where – in contrast to the top row – the focus is on a specific plant section where work is being performed. Detailed descriptions or the consequences of alarms are usually connected to the monitors on the control room console. In the event of an alarm, the special lighting for the control room workstations and video walls further emphasises the acoustic warning and supports the control room operator. 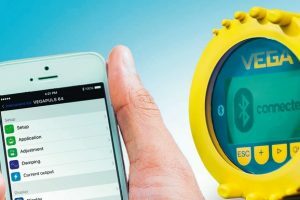 The JST “AlarmLight” which is used for this purpose can be activated by the monitoring system and blinks or changes colour if an error message is received. 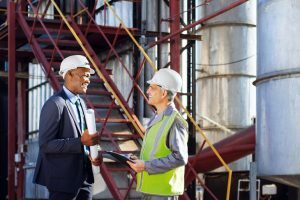 Redundant inputs and outputs are likewise available for all signal sources and outputs – in other words, for every control station from the process control system as well as for every monitor that needs to output something. Each monitor has two connections to the overall system. If one channel malfunctions, nothing happens. The redundant body ensures that communication is maintained as far as possible. The highest level – the complete system – moreover has a fully redundant design, so that the control room always provides maximum safety.